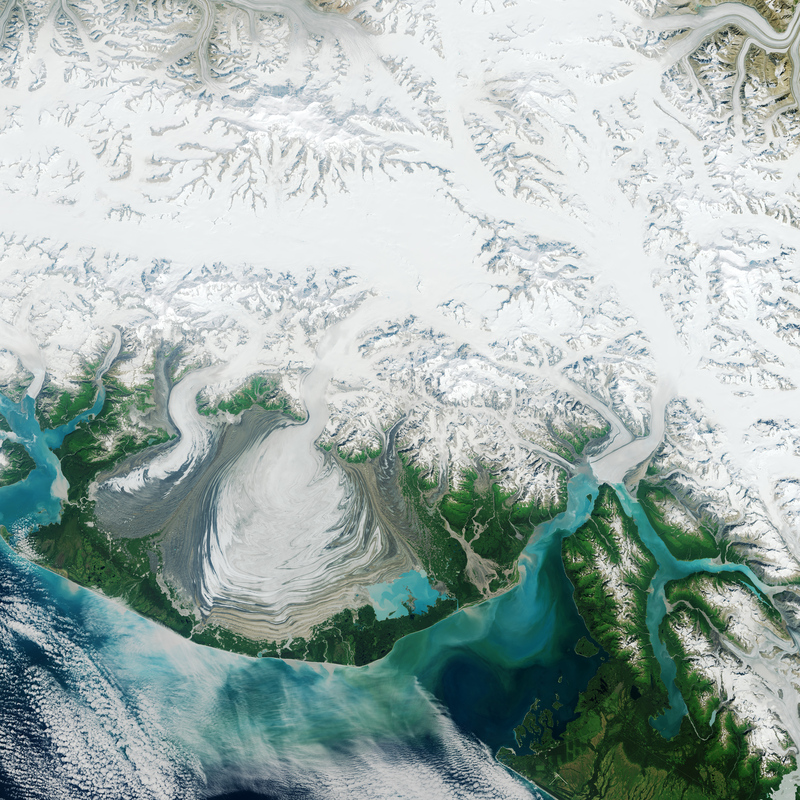 The image above, acquired by the Operational Land Imager (OLI) on Landsat 8, shows Hubbard Glacier on July 22, 2014. 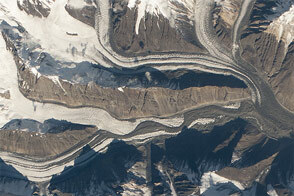 The second image shows a close-up of the glacier’s terminus on that day. Yellow lines indicate the location of the terminus on August 1, 1978, and on July 13, 2002. 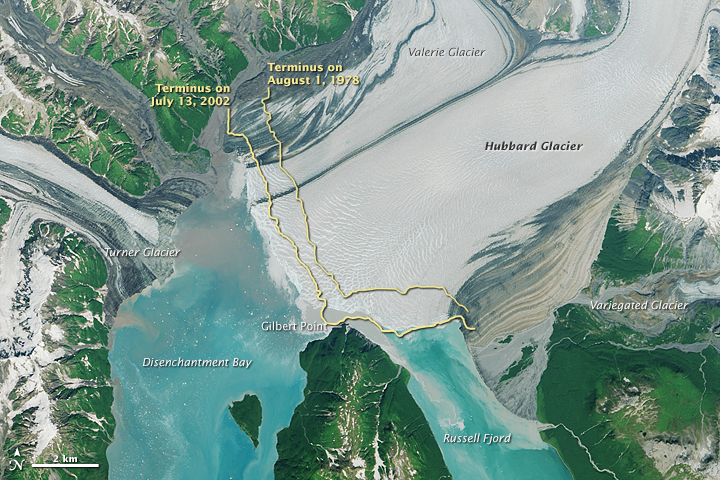 Twice in the past hundred years—in 1986 and again in 2002—the moraine has made contact with Gilbert Point and blocked the entrance to Russell Fjord. With nowhere to drain, runoff caused the water level in the fjord to rise rapidly. 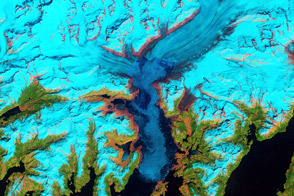 The image below, acquired on July 13, 2002 by the Enhanced Thematic Mapper Plus on Landsat 7, shows the glacier the last time that it sealed the fjord. Water levels to rose 0.24 meters (0.8 feet) per day. 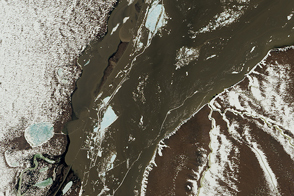 However, the closure was temporary, as water pressure overpowered the encroaching ice and debris and burst through the natural dam, returning the fjord to normal levels. 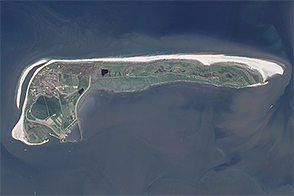 Those consequences provoked her to investigate what controls the terminus position and its advance, and to estimate when the fjord might become permanently blocked. The findings, recently accepted for publication in the Journal of Geophysical Research, explain how the mechanics at the terminus override the influence of other climate fluctuations. 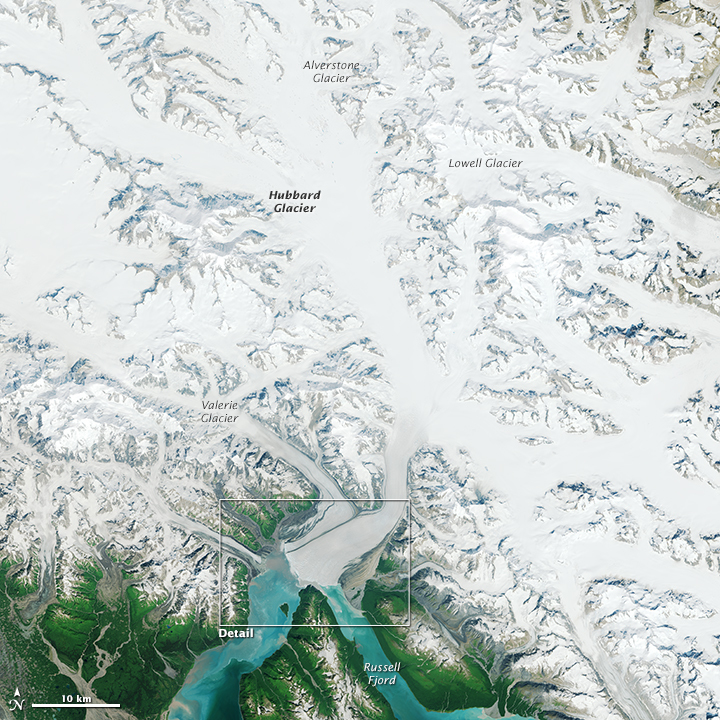 NASA Earth Observatory images by Joshua Stevens and Jesse Allen, using Landsat data from the U.S. Geological Survey and Hubbard Glacier data provided by Marcy Davis of The University of Texas at Austin. Caption by Kathryn Hansen. 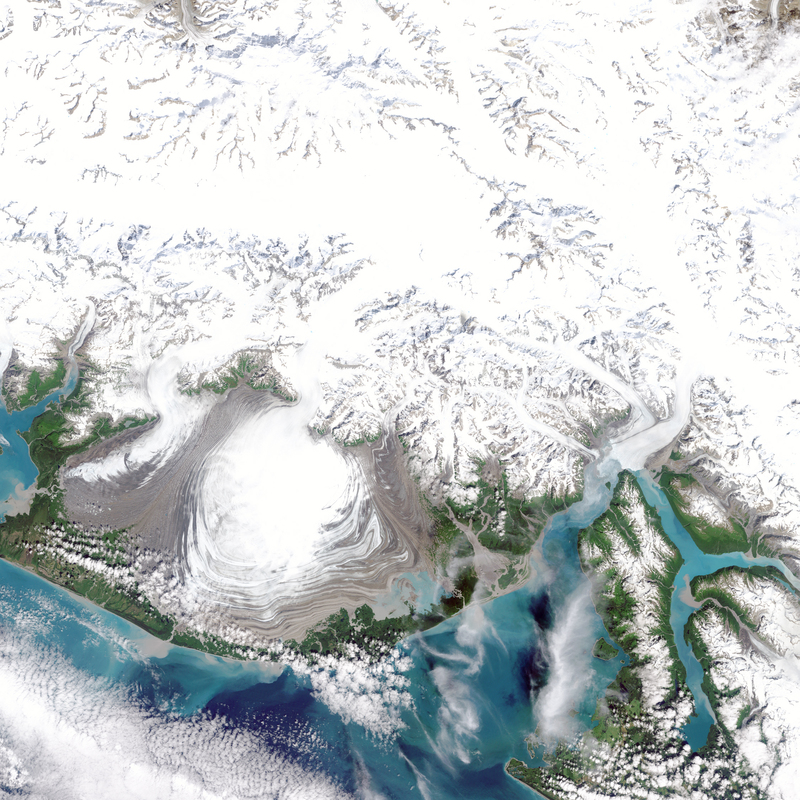 This tidewater glacier in southeast Alaska is not like the others; it’s advancing, and threatens to transform a fjord into a lake. Stearns, L.A. et al. (2015) Glaciological and marine geological controls on terminus dynamics of Hubbard Glacier, southeast Alaska. Journal of Geophysical Research, Earth Surface , 120. 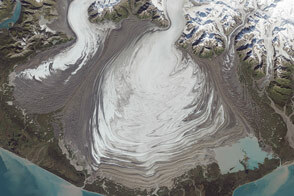 U.S. Geological Survey (2010, December) Hubberd Glacier, Alaska. Accessed May 19, 2015. 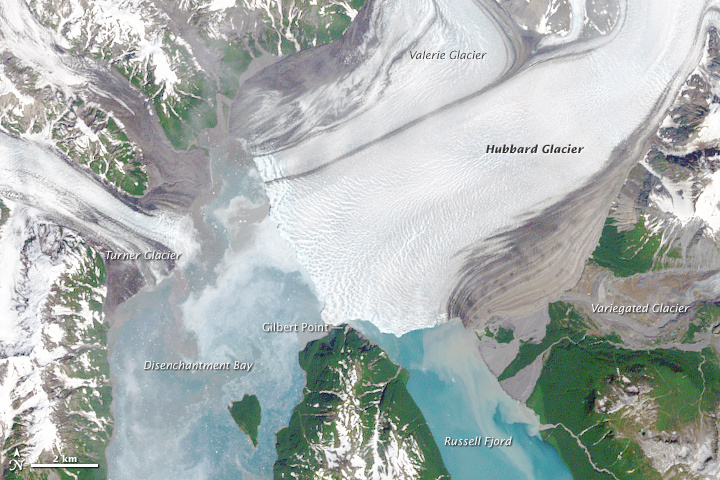 U.S. Geological Survey (2002, June 18) Advancing Glacier Coming Close to Blocking Fiord Near Yakutat, Alaska. Accessed May 19, 2015.